Panzanella salad may not be a traditional southern dish, but it sure fits in with our hot summer days and you don't even have to turn the oven on for homemade croutons - just grill your bread instead! Yeah, yeah... I know. Panzanella salad isn't southern and it usually isn't served with lettuce either, but I like mine that way so that is how I eat it. I just mix up the panzanella - a salad that was probably originally born out of the need to use up stale bread and whatever else happened to be in abundance in the garden - and then I spoon it over crisp romaine lettuce. The early panzanella salads probably did not even utilize tomatoes, but these days, it is pretty much built around the two - bread and tomatoes - and then mixed with whatever fresh garden veggies are on hand. 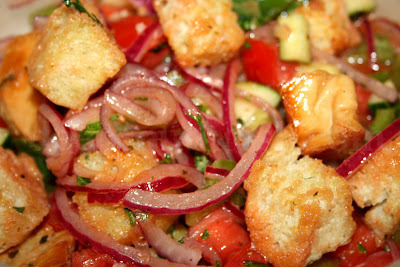 Panzanella was not a salad I grew up with and the first time I tried it, I made the one that uses soaked bread that you then squeeze out and tear. Not a fan. But, toast the bread and it's a whole 'nother story! Take that up a level and infuse that bread with garlic olive oil, and it's a real winner. You can really make this salad your own with a mixture of whatever vegetables you have on hand, or like, but some veggies you might include are red onion, red, yellow, orange or green bell peppers, cucumber, squash or zucchini. Fresh mozzarella is a great add-in, so throw some cubes in if you happen to have some on hand, tear in some fresh basil leaves if you like, add some chopped garlic, and maybe even some pitted kalamata olives. Some people even like to include capers and anchovies to add a level of saltiness. Preheat oven to 400 degrees and prepare the croutons. Set aside to cool. Whisk together the dressing ingredients. Add the tomatoes and onion, toss and let sit for 30 minutes. Add the peppers and cucumber, toss and refrigerate until ready to serve. About 15 minutes before serving, add in the croutons, mozzarella, olives, basil and capers, and toss in the accumulated juices. If the entire salad is not going to be eaten at once, use only as many croutons as needed, reserving the remainder for the next serving. Store leftover croutons at room temperature, in a zipper storage bag or other airtight container. Tip: Too hot to heat up the oven for croutons? Toast your bread on the grill instead! Thanks Dave! I take it that means you are headed home from Paradise? I know it's been fun there but I'll bet that you're ready to back here too, just a tad. Your blog is great and your recipes are gorgeous. Congratulations. I follow you from Argentina. Gorgeous, gorgeous salad! I'll definitely give it a try once I gather up all of the ingredients. BTW, made your Eggs in Purgatory over cheesy grits for brunch this morning. YUM! I always enjoy homemade croutons, this looks like a salad I could eat all day long! Cooling and refreshing too! your interview post is still scheduled to post at 1 AM tonight, so let's hope it's successful by blogger! it cooled off to 82 today from 2 days of wonderful rain! finally! Hi Roz! 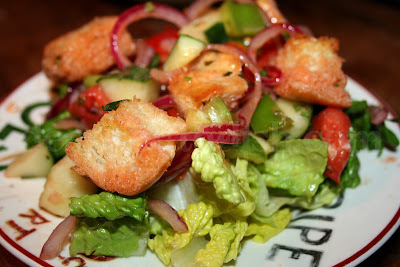 I love this salad - but admit I need the crouton style of bread rather than the soaked and squeezed. Then once it's doused into the juices of the salad, the bread absorbs the juice but still holds on to it's "body" if you know what I mean. Plus the infusion of the bread with the garlic is so good here and I just use that garlic right in the dressing.